Certain people just have “IT”. They are rare, but when you meet one, you know it. Ross Beaty is one. He just has “IT”. He is a winner. Of all the people with “IT” in the resource sector I have gotten to know, none have the style and gravitas of Pierre Lassonde. If he didn’t choose to conquer the mining sector, Pierre has the grace and style of a movie star who could have played James Bond. He once made a comment to me at a dinner that resonated with me: “Stay hungry my friends”. It was like I was having a conversation with the real-world version of ‘The Most Interesting Man in the World’. But rather than watching the bearded debonair gentleman pitching Dos Equis beer… I’m looking across the table at a living legend who is sharing the secrets to his success. Over an amazing 40+ career in the mining industry, Pierre has pulled off a lot of incredible deals. If you’ve invested in the mining sector for a while, you’ve definitely heard of Pierre Lasonde. Pierre is the billionaire founder of the huge mining royalty firm Franco-Nevada. Pierre is a legend in the resource business. Pierre is literally the coolest person I know in mining. He is a ‘Style Connoisseur’ as well as a wine connoisseur. His charm captures people’s attention… everyone in his vicinity gravitates towards every word he says. Even his accent makes you feel every word has a deeper meaning than it does. Pierre’s passion for life and business is contagious. I’ve taken his advice as an axiom I live by. As we were drinking an amazing Cabernet Sauvignon that he selected, Pierre gets into the details of one of the biggest success stories in the history of mining. It’s how he and his longtime partner Seymour Schulich took a struggling energy company with $2 million in cash and a market cap of less than $10 million… and transformed that company into +$15 billion mining powerhouse. (I’ve been in the industry for over 15 years, and this is one of the funniest stories I’ve ever heard). Before our legend was a billionaire wine connoisseur, he was an ambitious young resource entrepreneur looking for his big score. Like most mining entrepreneurs, he organized a site visit to showcase the potential of his projects. Well, not only was this his first mining site visit, the company did not have a lot of money left in the bank account… and really needed to impress its investors. Pierre needed to impress one large fund manager in particular. This fund manager flew in from Europe and was considering the company as an investment. Pierre wanted to get him to invest in the company and help the struggling venture. As this large fund manager checked into the hotel, Pierre had a full slate of two days with geologists and site tours planned. As is customary on site visits (and I’ve been on hundreds of these), the group has a dinner together before the next day’s activities. It’s a way to get a feel for management and the other investors and the company. The large fund manager didn’t show up to dinner. But since they already had the day’s trip organized, they went ahead with the site visit without the big European fund manager. That night, the fund manager was a no-show for the group dinner. Feeling deflated, our young entrepreneur moved forward with the planned site visit. He wondered why a fund manager would travel all the way from Europe to Nevada for a two-day site visit and not attend either day. He found out the next morning. As a good host would do, Pierre wanted to say goodbye to the European fund manager who he intended on impressing and getting a lead order from. However, the fund manager was late again. He missed breakfast and was on the verge of missing his flight back to Europe. A phone call was made and the fund manager rushed to the airport. Pierre noticed that the woman the fund manager met at the elevator before he went to his room, on the first day, was the same woman that came out of the elevator with him as he left for the airport. Pierre used his last few moments to try to obtain a lead order from the fund manager. Pierre said it was unfortunate that the fund manager was too busy to make the site visits. They contained so much potential. That was one of many, many stories over a two-hour dinner. But the dinner got me thinking about our mining legend. What more can he and his company do in the mining space? I’ve tracked the mining space for many years, but one space I’ve had a keen interest in has been the royalty and streaming business. 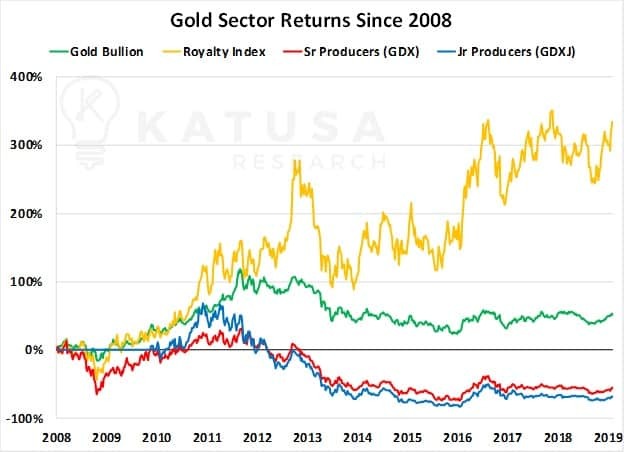 For example, since Jan 1, 2008, the royalty/streamers index I created have significantly outperformed the gold mining index. And it’s outperformed the actual price of gold itself. The chart below shows how the royalty index (in yellow) has delivered over 200% gains since Jan 2008. On the other side, the GLD (Gold ETF backed by “gold”) returned just under 50%. And the actual miners have delivered negative returns during the same time. This one chart tells us that we need to be exposed to the royalty/streaming companies. But many people have stayed away from the royalty/streaming companies because they appear to be expensive relative to the miners using traditional financial metrics. Katusa Research has spent almost a year working on our “Ultimate Royalty Report” that we will publish on February 17th, 2019. In this report, we will break down all the different financial metrics you need to know about the sector. You don’t even have to like gold or mining to see the opportunity. You just have to like making money. Special connections or being rich are not needed to see incredible gains from this business model. And not just in mining. The A&W Revenue Royalties Fund (AW.UN) collects royalties on every sale at the burger restaurant. It’s up 200% over the last decade (not including its lucrative distribution). Altius went up 5,600% from 2001 to 2007. Ligand Pharmaceuticals (LGND) partners with early stage drug companies and earns royalties on drug sales after approval. Ligand is up 12,650% from 2010 to 2018. Make no mistake, making 50 or 120 times your money does not happen often. But you can see how getting an early piece of royalty companies, that steamroll old business models, can be very, very lucrative. The unusual royalty company in our new report has one of the most profitable and disruptive “upside kickers” I have ever seen – where three years from now you could be seeing potential 1000% gains or more. This is the reason why I’m staking my reputation on this one pick and making this a monster personal investment for me. I never touch an investment opportunity that doesn’t have a rock-solid margin of safety. When I put millions of dollars of my own money on the line, the opportunity better have near 100% conviction. And the upside has to be asymmetrical. And that’s where I’m at with this opportunity. The underlying company will stuff money into your pockets over and over – no question. I explain it all in my report. But it’s the amazing upside that has me building a very large position in this one ticker symbol. I’ve spent nearly 12 months putting this report together from start to finish. If you want to get in on this opportunity – easily one of the biggest of my career – look for my brand new subscribers-only royalty report, coming out on Sunday February 17th and consider signing up to get the name, ticker symbol and the full story. I think this company is also a huge buyout candidate… and you’ll never guess who I think the buyer is going to be (hint: it’s one of the most valuable companies in the world right now). The next time I have dinner with our Billionaire Style Connoisseur – the King of the royalty business model – he will have more exciting stories to share. And I hope to have a killer one of my own. Copyright © 2019 Katusa Research. All rights reserved.